Courtesy photo by Colter Hoyt. 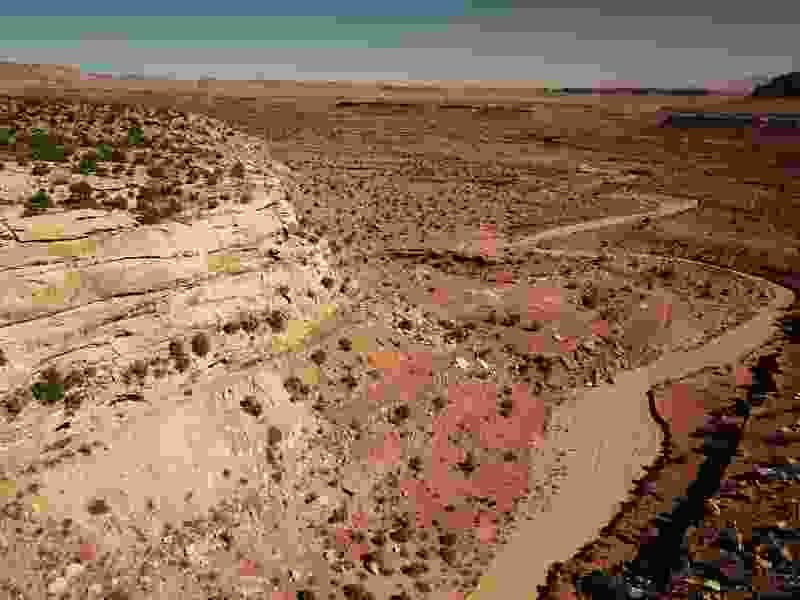 A Canadian firm has announced plans to mine new claims filed on Colt Mesa in Utah's Circle Cliffs, public land that was the Trump administration removed from Grand Staircase-Escalante National Monument. A Canadian firm has announced its intention to mine copper and cobalt on public lands in Utah’s scenic Circle Cliffs east of Boulder, telling potential investors it has acquired what appear to be the first mining claims filed on lands removed from Grand Staircase-Escalante National Monument. The move set off alarms among environmental groups seeking the monument’s restoration, but it remains unlikely that Glacier Lake Resources’ plans will be realized anytime soon. The Bureau of Land Management will continue to manage these lands as a monument until a new management plan is in place. Others argued the recent appearance of the mining proposal suggests access to minerals motivated the Trump administration’s recent order to dismember the Grand Staircase. President Bill Clinton established the 1.9 million-acre monument, sprawling across broad swaths of Garfield and Kane counties, in 1996. But late last year, President Donald Trump signed an executive order reducing the monument by almost half. The Southern Utah Wilderness Alliance and several groups quickly sued seeking to restore the monument. Starting Feb. 2, however, mining claims could be filed on the nearly 900,000 acres removed from the monument. W. Dan Proctor, a geologist based in Pleasant Grove, began examining an abandoned mine site and staked out claims marked with 4-foot-high monuments, according to documents filed April 23 in Garfield County offices in Panguitch. He filed 10 claims covering a 266-acre rectangle that saw mining activity in the early 1970s, according to a news release posted June 13 by Glacier Lake, based in Vancouver, British Columbia. The remote spot, accessed by a dirt road from Boulder, is a few miles west of Capitol Reef National Park’s Waterpocket Fold and abuts the northern boundary of Glen Canyon National Recreation Area. The BLM was unaware of Circle Cliff claims until only recently when they were submitted to the agency’s state office in Salt Lake City. Yet Glacier Lake’s new release proclaims “acquisition of Colt Mesa Copper-Cobalt property,” even though no property right has been established to these lands. “Surface exploration work will start this summer on the Colt Mesa property and drill permitting will be initiated shortly,” Glacier Lake President Satvir “Saf” Dhillon said in the release, which also boasted “excellent year-round logistics.” Dhillon did not respond to voicemail messages. The company has yet to contact the BLM’s Utah office about its proposal, according to Swift. The company cited “recent sampling,” which showed mineralization for zinc, nickel and molybdenum, in addition to the copper and cobalt. The site was mined between 1971 and 1974, according to the release, and the mine’s tunnels have been sealed. Culver believes Glacier Lake is overstating the site’s potential to drum up investor interest. “This is not property. They don’t own the land. They have no access to damage the land,” Culver said, adding the BLM should inform potential claimants that these lands are not currently available. The filing of a mining claim is an initial step toward establishing a legal right of access to the underlying minerals. Asserting a right requires the payment of annual fees and maintenance work that might not be allowed under current management prescriptions. The BLM is revising the plan for the 900,000 acres removed from the monument. It could be several months before it is finalized — if not longer. This land could be again available for mining but only if Trump’s executive order survives legal challenges and the revised management plan for these lands allows it. Both are big ifs, environmental activists say.